We’ve been working for change in Room 204. We’ve been working for Haiti. 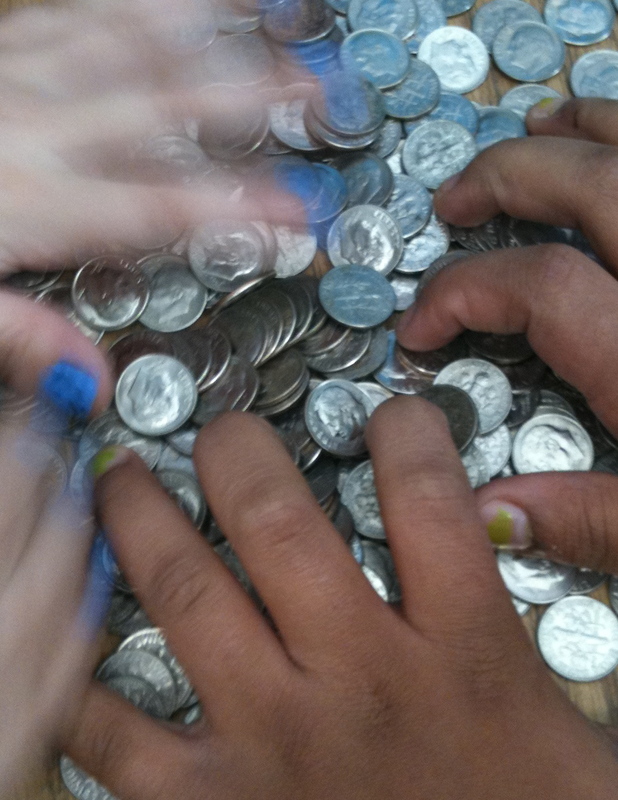 We’ve been working for change: for quarters, nickels, dimes, and pennies. The children have cleaned closets, made beds, emptied dishwashers, cleaned rooms, and taken out the recycling. We can’t go to Haiti to help, but there are other things we can do. We have worked for change and it has changed the way we see things. We can help with our money and we can help with our words. We read these notes and noticed the structure and tone. With a sense of fun, we began to emulate them. It was good practice for voice. On January 12, Haiti was hit with the terrible earthquake. We were hearing and reading about real time suffering. Eight year olds and nine year olds lost houses. Parents. Lives. How could we help? Our class representatives came back from the Student Council Meeting and told us that each class would be collecting money. Mrs. Jacobs would give the class who raised the most money a pizza party. We brainstormed chores that could be done at home for money: Chores for Change. Money came in every day. Suddenly a new kind of thank you note began to emerge. We became very aware of the people who were helping: the international aid workers. Room 204 became a very special place this week. The movie below will give you a glimpse. The letters are written in an international language: the language of encouragement. These letters will be sent with the money. We raised the most in the school. And we are also sending to Haiti the money that would have been spent on our pizza party. There will be time for pizza later. Now is the time for our help. And our gratitude. Annie Campbell is a National Board Certified third grade teacher and loves her work. She especially enjoys teaching children how to be enthusiastic readers, writers, and problem solvers. Every year, she hopes to inspire her students to be committed citizens who know they can make a difference in the world around them. When she is not teaching, Annie enjoys cooking for family and friends; she likes to lose herself in a good book; she loves discovering new ideas, restaurants, perfect picnic places, and movies with her husband, Ben. Wow! You are teaching so much more than thank you notes. Kudos to you and your students, they are making a difference in someone’s life today. what a wonderful way to teach so many different things. There is hope with a class like yours making such a huge difference! You all are my inspiration! Your video brought tears to me eyes! The right note at the right time. The movie is beautiful, especially the music along with the children’s words. Thank you. I love what you and your students have done. Would you mind if I feature it on TWT later this week? Well done! A great example of responsive teaching. What an inspiration you are! All teachers should see what you are teaching the youth of today…far more than writing–generosity, compassion, empathy. So many lessons. Thank you for them all! I was fortunate to see this teaching first hand Thanksgiving at the Science Museum. They are learning so much about life. What an inspiration you and your class are! You brought life to a standard and made it a real life experience. You are to be commended on your showing your students how to express thanks, hope and love. Kudos to you and your students. This passage and video was such an inspiration- It’s wonderful to see the students so excited about writing! I loved how passionate and gracious the children were toward those who donated their time to help the victims in Haiti. Thank you for doing more than just teaching- You’re inspiring kids and teachers everywhere!